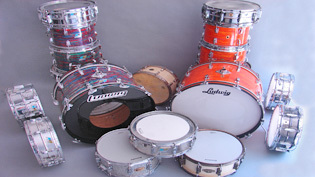 TheDrumDealer.com is an online division of Rock N Roll Vintage Inc, an authorized Chicago Ludwig Dealer. If you have any questions on our Ludwig Drums, need a quote or want to place an order just drop us an email, call or stop by our shop. We are conveniently located at 4727 N. Damen Avenue in the Lincoln Square neighborhood on Chicago's North Side. Please note when you consider the hardware, wraps and kit lines Ludwig makes there are literally thousands of different drum kits available. In order to allow you to configure exactly what you want most orders are factory orders and not filled from stock. We only stock close outs and special offers. We ship orders throughout the USA. Please Note: We're sorry but we cannot provide appraisals or date your gear. Visit eBay for current retail price information on used gear. Here is information provided by Ludwig on dating your kit. TheDrumDealer.com, a Division of Rock N Roll Vintage Inc.